I couldn’t resist bringing you all another popsicle recipe so soon. They’re just so quick and simple to make, and are absolutely scrumptious! 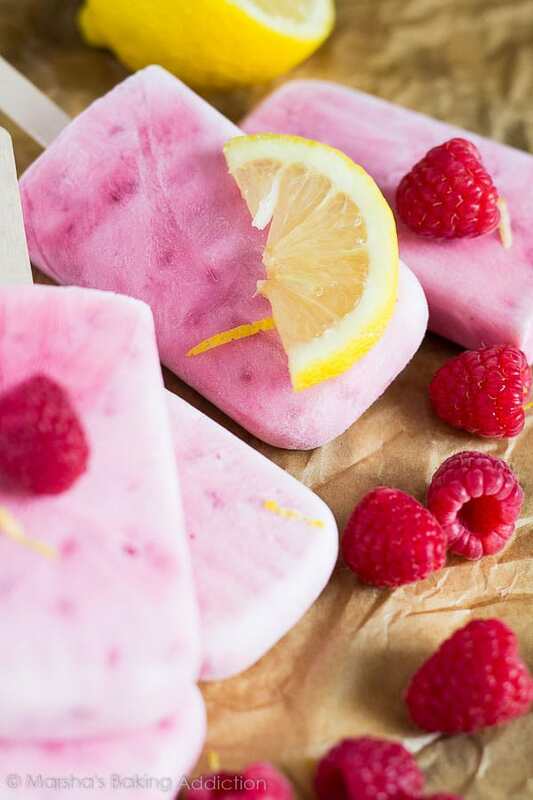 Today’s popsicles are made with only 4 ingredients – vanilla Greek yoghurt, honey, raspberries, and lemon. You probably already have these ingredients at home! both kids AND adults love them! 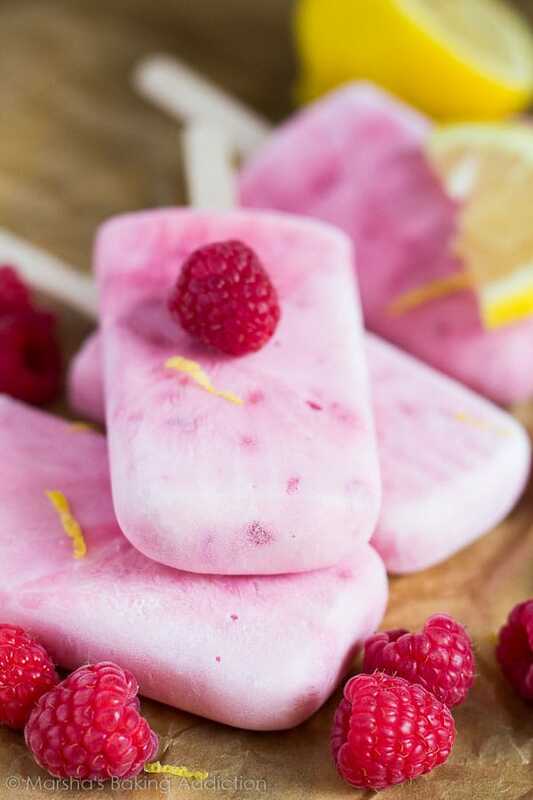 These popsicles are the perfect summer treat, and they’re healthy too! They’re high in protein and fibre, and are low in calories. 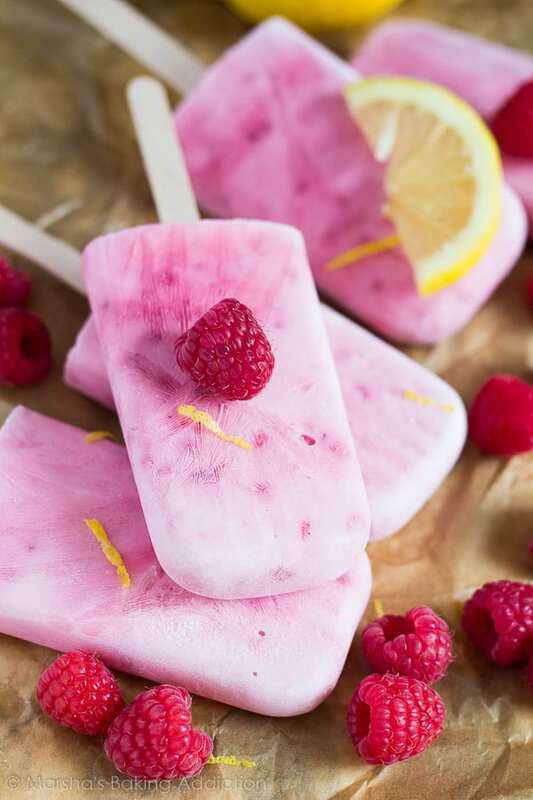 What better way to snack than on these deliciously refreshing popsicles! These are perfect too if you struggle to get your kids to eat fruit and yoghurt. What kid doesn’t love popsicles? More popsicles to try next! 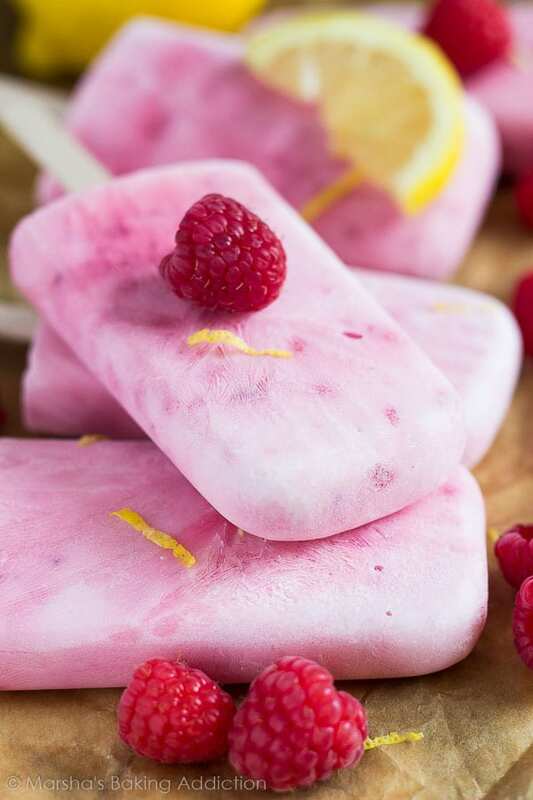 Deliciously creamy Greek yoghurt popsicles infused with raspberries and lemon. Quick and simple to make, and only 4 ingredients! Using a food processor, blend the raspberries and honey until almost smooth. Pour into a large bowl. Combine the yoghurt, lemon zest and juice (add as much of the juice as you want to your preference), then add to the raspberries. Mix together but do not fully blend. Pour the mixture evenly between 6 popsicle molds. Freeze for 2 hours before putting wooden popsicle sticks in the centres. Freeze for a further 4 hours or overnight. Wow, what absolutely GORGEOUS popsicles!! beautiful color and I bet they taste amazing. The addition of lemon is perfect! Delicious and colorful my daughter will love it. LOOOVE these popsicles, Marsha! The color is just gorgeous!! Plus you can never go wrong with yoghurt, raspberries, lemon and honey!! Fabulous, girlfriend! Cheers! 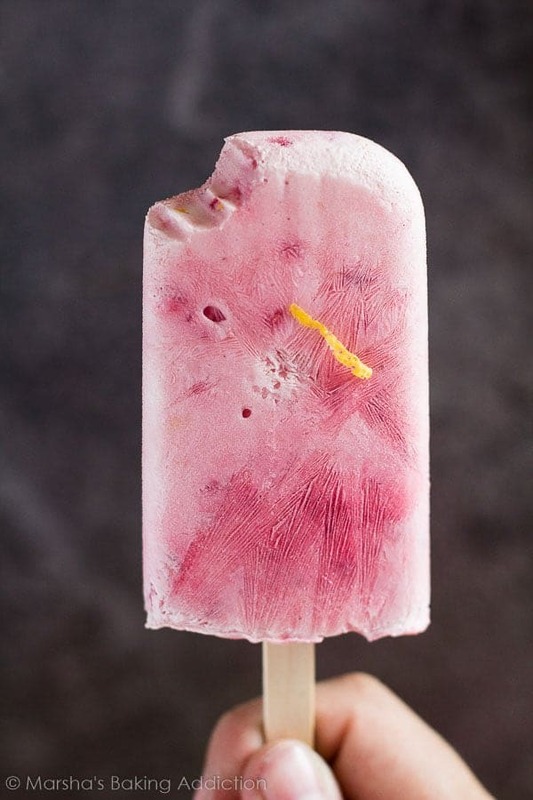 Yum I love raspberry ice lollies! I made greek yoghurt once with raspberries but made them in swirls? beautiful and delicious! oooh, yes please! 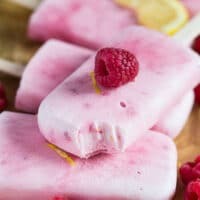 I make some similar ice lollies and LOVE the Greek yogurt in them! so healthy, too! 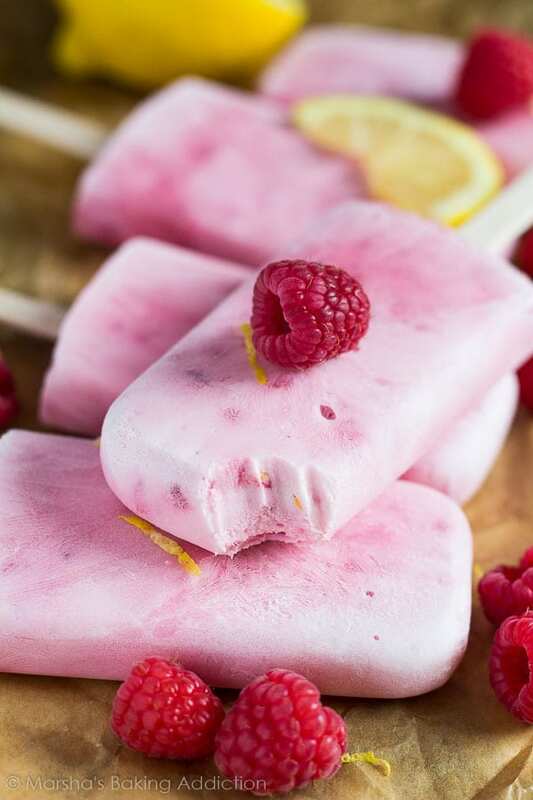 I am just crazy about pink color, what an amazing popsicles with the beautiful color. I’ve never worked with yoghurt and lemon before, and I’m just wondering – does the yoghurt, having milk in it, not curdle with the lemon? The recipe sounds delicious though! Hi Isabella! Nope, no curdling happens – I make these a lot through summertime 🙂 Enjoy! These look so yummy! I’ve pinned to try during the summer! Thank you for your post!